Finally, finally, I got my combs. It felt like a big purchase (though when you think about it, it's the same as just a few big orders of yarn or fiber), but I really wanted them so I saved up and they're here! They're Valkyrie Extra Fine Minis, from The Whorl's End. When I opened the box, I was delighted to see that it was padded with wool :) Donna keeps some mule (BFL cross) sheep, and this fleece is long and shiny, so that's probably what it is. It makes perfect combing practice! What to do with the fleece? There's a fair amount of it, certainly enough for a little project. It's pretty soft and shiny. The fleece is aesthetically lovely, with those long curls and that pearly sheen. I think it will make lovely, lustrous lace. 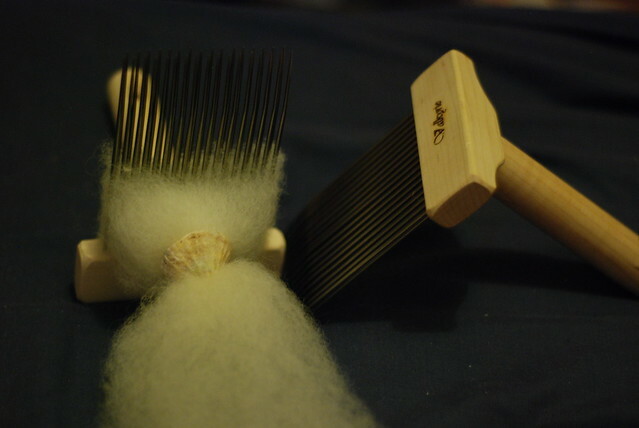 The little nests are coming off my combs as fast as I can produce them. It's a little addictive, turning locks into perfect-looking top. It's definitely more productive and a better result than my previous ersatz method. I'm dizzing off the combs with a seashell I found on the beach in Devon - which already had a hole in the center. The broken edges of the shell were smoothed down by the sea. The diz is so easy to use with these super-long locks! The diz hole is about 1.5cm or 1/2 inch in diameter, which makes for quite thick top (the fiber fluffs out a LOT after you pull it through that little hole!). In the future I'll look for a smaller hole - but, the rounded shape is just perfect for funneling the fiber through. 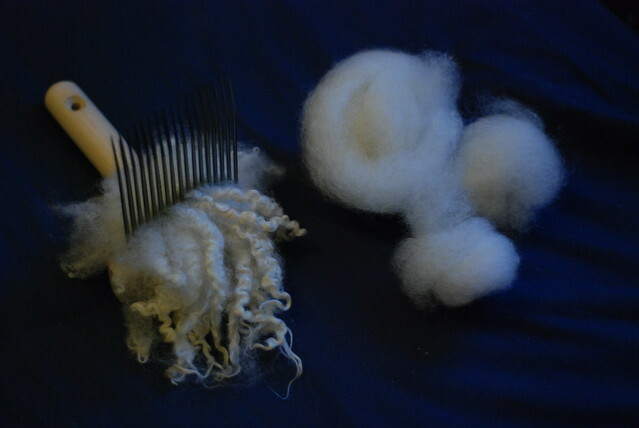 I've tried combing some of my fleece stash, and everything has turned out great. It was tough deciding which combs to get - Valkyrie offer Fine, Extrafine, Superfine, and Viking combs (larger combs for medium to coarse fibers). I like to work with a variety of fibers but favor the finer side, and I think the Extrafines were a good choice for me. 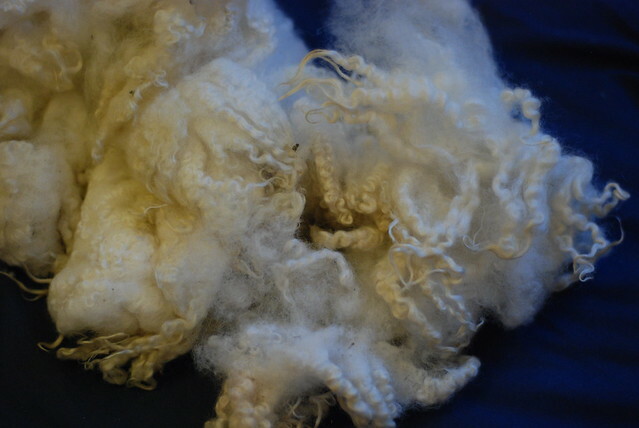 This is some Gotland I've been stashing away - previously I've been spinning it from the lock, which has turned out well, but the fleece has some color variations. When each lock was a slightly different shade from the next, it would spin up into a sort of subtle striping. For the project I have planned I wanted a more consistent look - it was easy to blend the lighter and darker fibers together on the combs.